CY91: Home Perched along the banks of the majestic Macal River in Vaca Lake, Cayo District! Home Perched along the banks of the majestic Macal River in Vaca Lake, Cayo District! Cayo home real estate! Retirement Home in Cayo District! Belize Eco-tourism Corridor! This custom built home was designed to blend in with its natural jungle setting while providing a footprint that maintains the precarious balance between comfort and preservation of its surrounding forest and wildlife habitat. Yes, this is in Belize! A home for the nature lover or for someone wanting to change the fast lane for more panoramic views, abundant Flora and Fauna. The home was built in 2015 and is made from concrete blocks, metal roofing with beautiful local hardwood ceilings and doors. The home was designed as a two-level home with the upper level accommodating a full size Master Suite with a small walk-in closet, a private bathroom that features a custom built stained concrete wash basin and a riverstone shower wall. The suite has a 22 ft ceiling with 14 glass louver windows, 6 solid windows and a sliding glass door with screens providing plenty of natural lighting and optimal ventilation. A built-in wooden ladder provides access to the loft, which can be used as an additional sleeping or living area. The suite also has a ceiling fan, which is hardly ever needed. The kitchen has ceramic tile counter tops and plenty of shelves for dishes and cookware. It comes with a small gas stove, full size Sankey refrigerator, a large capacity Sankey washing machine (both with inverters for energy efficiency) and a pantry. It also has a pot rack that is suspended from the ceiling. The flooring throughout the main level is a river stone tile, which is easy to maintain. The beautiful deck is accessible from the master suite and kitchen and features a custom wood fired hot tub big enough to comfortably seat 2-4 people. It also has a built in planter, where you can grow flowers, herbs and vegetables. 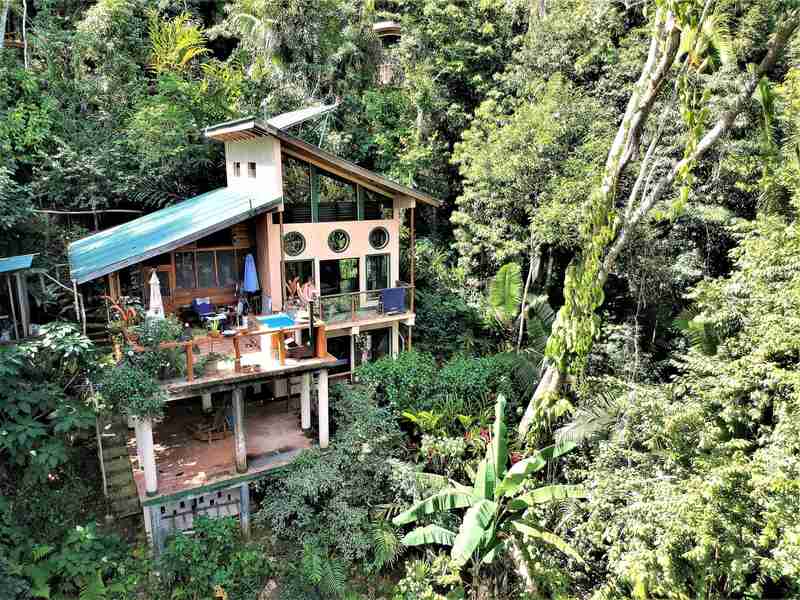 The deck is overlooking the forest and river and is ideal for watching the birds and monkeys, which visit frequently. At night the stars are clearly visible because of the lack of light pollution. The guest suite is on the lower level. It was designed to accommodate a live in caretaker or as a guest bedroom. It has a private bath with shower similar to the master suite. A kitchen sink with countertop was added to be able to rent this space out without having to let the guests have access to the main upper level. It features a custom built queen sized mahogany bed with a single bunk bed on top and shelves/clothing racks on each side. There is also a solar room that has plenty of storage capacity and a separate storage room with shelves. A Hotpoint gas dryer is also on the deck. The lower deck has plenty of room to hang clothes, hammocks for relaxation or for larger gatherings on rainy days. Since the terrain of this lot is rather steep, a good portion below was terraced for easier access. The garden has many fruit trees including mango, avocado, citrus, coconut, star fruit, soursop, plantain and banana. There is also an abundance of blooming plants that are attracting hummingbirds, bees and butterflies. A walkway leads from there down to the lake with plenty of rooms for kayaks. The home is completely off grid. It has a 2kW Outback solar system with 5 panels, a brand new lithium battery and an automatic 8kW Generac butane backup generator. The system can be monitored from anywhere in the world over WiFi. It also has a 5000 gallon 2 chamber concrete water cistern for water catchment and a butane on- demand water heater. For sewage it has a 3 chamber septic system. The butane gas bottles are in a locked housing by the carport and connected to the appliances in the house. This home is situated in one of the best master planned Eco-friendly and Eco-Green Community of Better in Belize nestled in the Vaca Area with breath-taking, panoramic views of the Karst Mountains and accessible to the famous Vaca Lake where one can take pontoon tours of the Lake and enjoy the scenery, the abundance of flora and Fauna. The entire area enjoys abundance of wildlife, including troops of Howler Monkeys and Spider Monkeys, Gibnut, Aguiti, Kinkajous, Jaguar, Tapir and huge variety of birds for the Bird Lovers throughout the area. There are numerous homes already built in the development with various residents and If you don’t want to live there permanently, this home has great potential for income as an AirBnB. It can sleep up to 7 people. The community already has several very successful rental homes, that are booked a large portion of the year. The Bylaws allow for your own building plans with some restrictions on seize depending on the lot size. The entire development has good gravel roads. A 4×4 is necessary in some areas in the community but it is not necessary to aces these lots. According to Google Earth the area is over 1,000 feet elevation above sea level and with combination of pristine jungle makes the area to be 6-8 degrees than in town! Better in Belize is situated some 10.9 miles from Benque Viejo Del Carmen in Wester Belize! It takes roughly about 30 minute drive on all weather road. The road is passable by taxi but vehicle with higher clearance is desirable. Pontoon tours on Vaca Lake with access to 3 beautiful waterfalls, a beach that you can get to by kayak, horseback riding, cave tours, bird watching and hiking are on the premises or close by. You can access the lake from the property. The famous Mayan Ruin of Xunantunich is only 35 minutes away. Shopping for groceries and large hardware store, banking, medical facility, schools, are located in Benque Viejo Del Carmen, Cayo. << CY90: 2-Hillside 0.32 Acre Lots in Better in Belize Eco Village, Community Garden view in Vaca area, Cayo! Cayo real estate! Land for sale in Cayo! Buy in Cayo Belize!